In Nova Scotia, social assistance is called Employment Support and Income Assistance (ESIA), which replaced the Family Benefits Program and Municipal Social Assistance in 2001. ESIA provides financial assistance and employment supports to help people maximize their self-sufficiency by increasing their employability and independence. Basic assistance through ESIA consists of a personal allowance and a shelter allowance. The personal allowance covers the cost of food, clothing, and miscellaneous essentials for adults in the family. The shelter allowance is intended to cover rent/mortgage, fuel and utilities costs, up to an allowed maximum. This maximum is adjusted to reflect family size and the type of accommodation. There were 25,900 cases (families and single adults) in Nova Scotia’s Employment Support and Income Assistance program in March 2018, and 38,600 beneficiaries (individual claimants, their partners, and dependent children). These numbers fell rapidly during the mid-2000s and have been falling much more gradually since 2013. 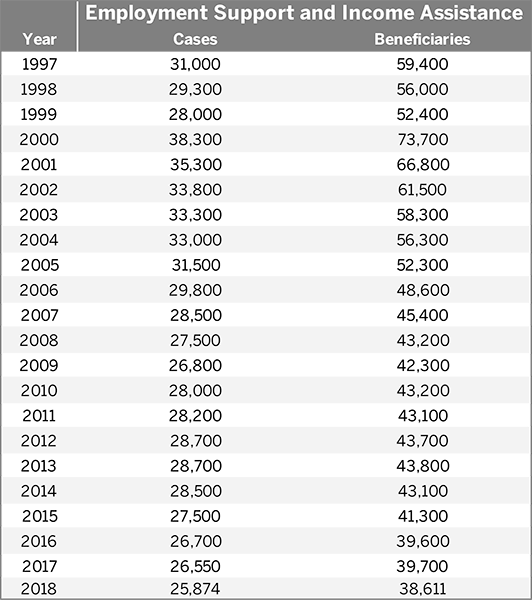 In March 2018, both the number of cases and beneficiaries were at their lowest level for at least two decades. The data for 1997 to 2001 cannot be validated as they may include municipal assistance in addition to provincial family benefits. During this period, it was common for family benefits clients to access special needs benefits from their local municipal social assistance offices.